Cobblestones are an inevitable part of cycling in Europe. We rode over our fair share in The Netherlands, some almost as smooth as asphalt, others not so much. 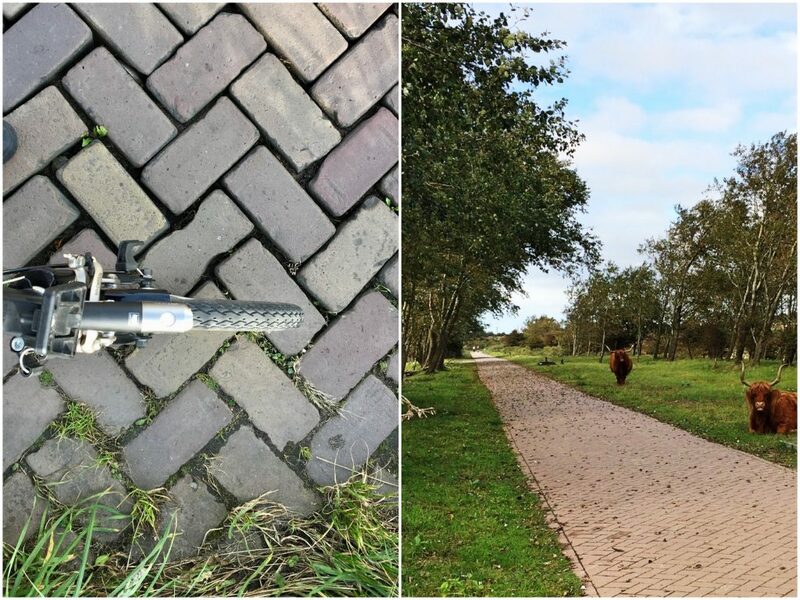 Worst Dutch cobblestones were in Durgerdam (left). Best were in the Zuid-Kennemerland National Park (right). 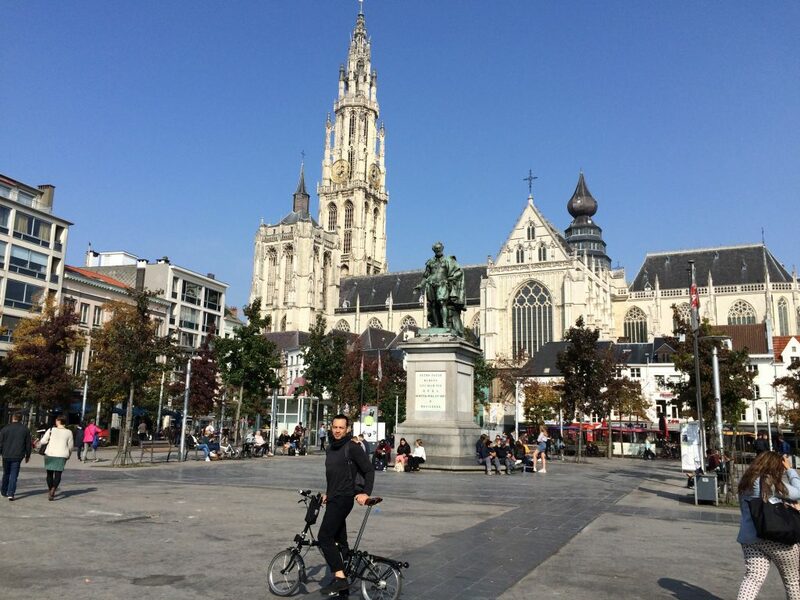 This was the first city in Belgium we visited, and it was only a quick day stop. We took the train, left our bags in the station lockers, and cycled into the heart of the old city. 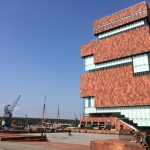 It’s a 20 minute walk from the Antwerpen-Centraal station, and another 20 minute walk north to the MAS, and another 10 minutes past that is The Red Line Museum. 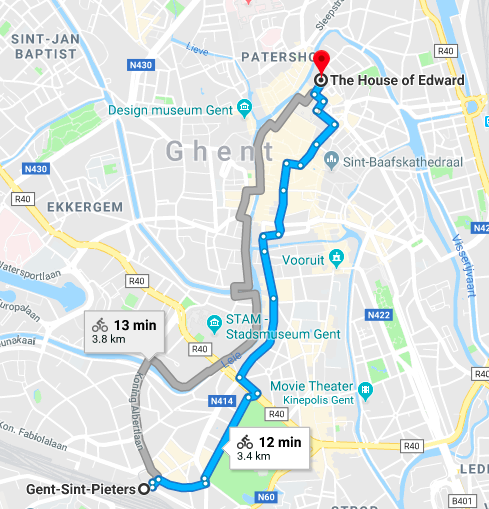 Not a huge area, but not small either, so we’d recommend cycling around Antwerp. 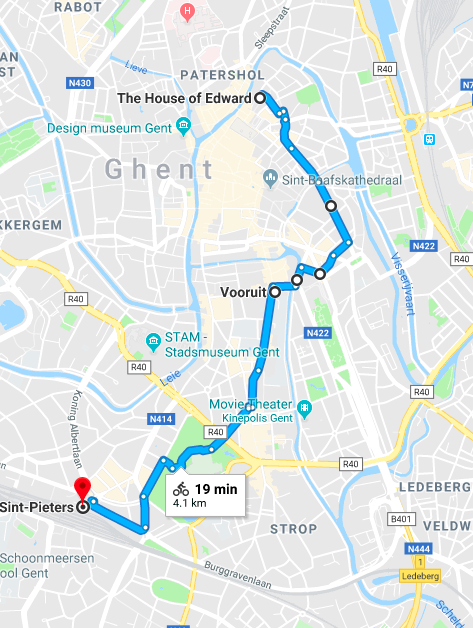 Of all the cities in Belgium, Antwerp had the smoothest streets. 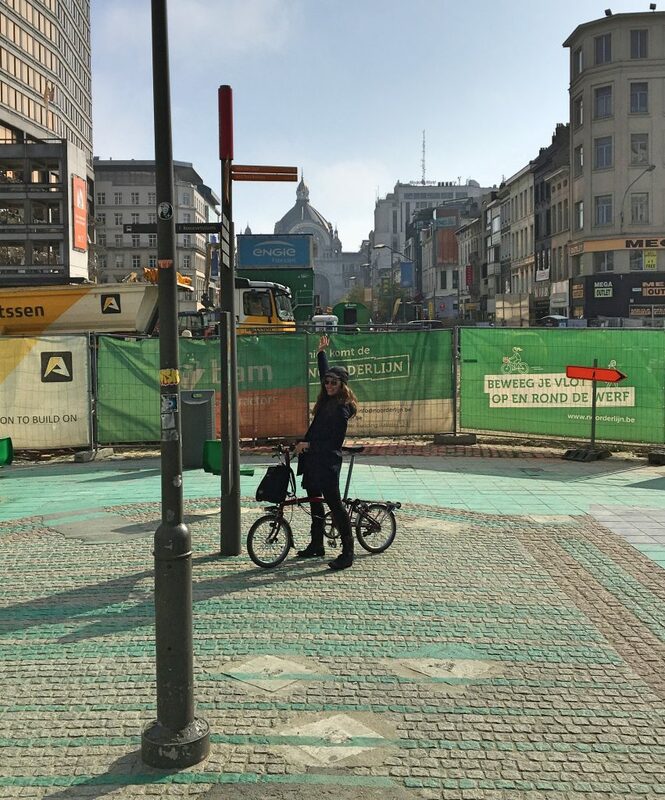 When we were there (Fall 2017) there was lots of construction to turn Antwerp’s main drag into a car-free zone. It’s going to be gorgeous! 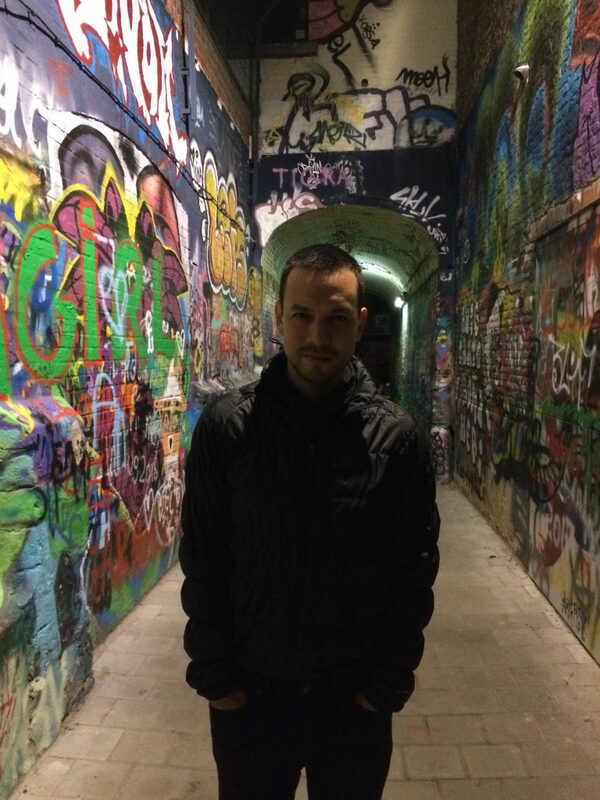 Notice the cobblestones I’m standing on in the photo are bumpy, but that’s the walking area. See the smoother stones on the outside? That’s the cycling area. Here’s another shot of the nice, smooth, square stones, right besides a bike share dock. 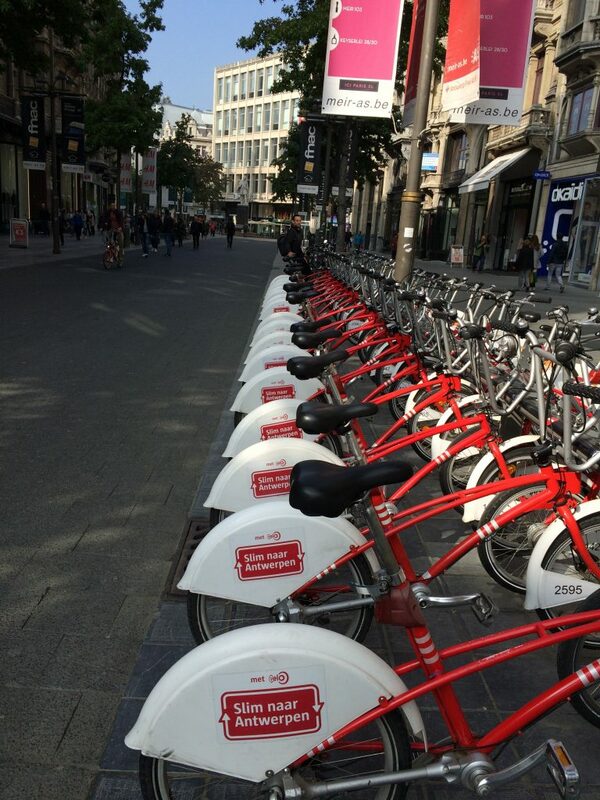 We saw lots of people (mainly locals, we think) riding these signature red bikes. In Groenplats square, there are paths of smooth square stones to ride. Off those paths, the cobblestones are bumpier. Groenplats square cobblestones and art. 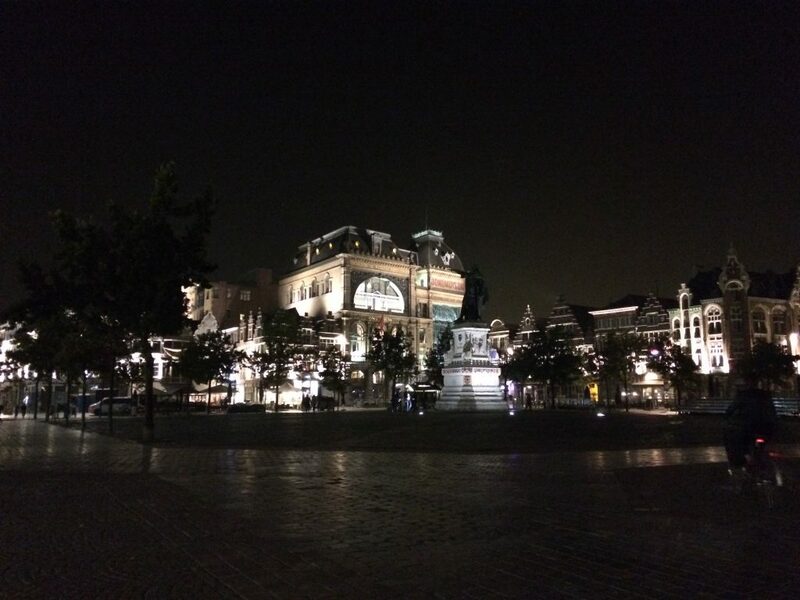 Next up is the Grote Markt. 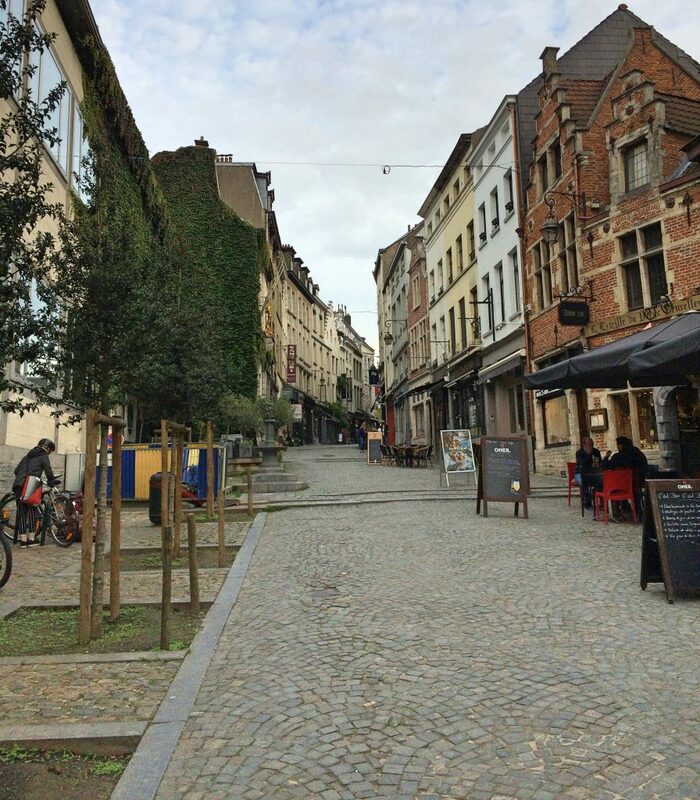 The cobblestones here are medium-bumpy for Belgium, but you won’t be racing through anyway. 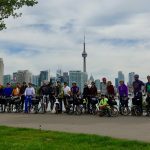 Ride slow or walk your bike as you take in the sights. Grote Markt panorama from the Cathedral of Our Lady to the Town Hall. The only place we found super bumpy cobblestones was riding the side streets between the MAS and the Red Line Museum. So on our return, we stuck to this nice paved bike path along the harbour. It’s not the most scenic ride with the road blocking the view, but at least it’s smooth! 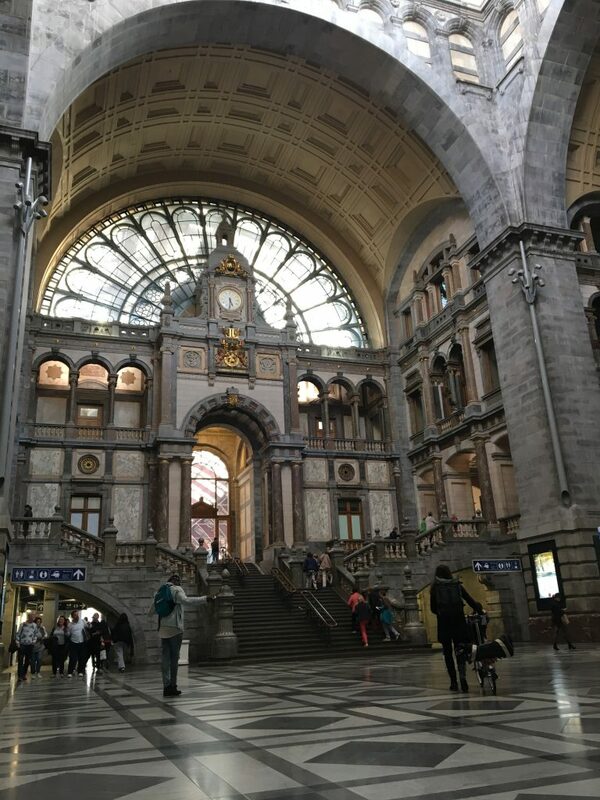 Leaving Antwerp via its beautiful train station. Old Ghent street with abysmal cobblestones. View of the Leie river from Zuivelbrugstraat. 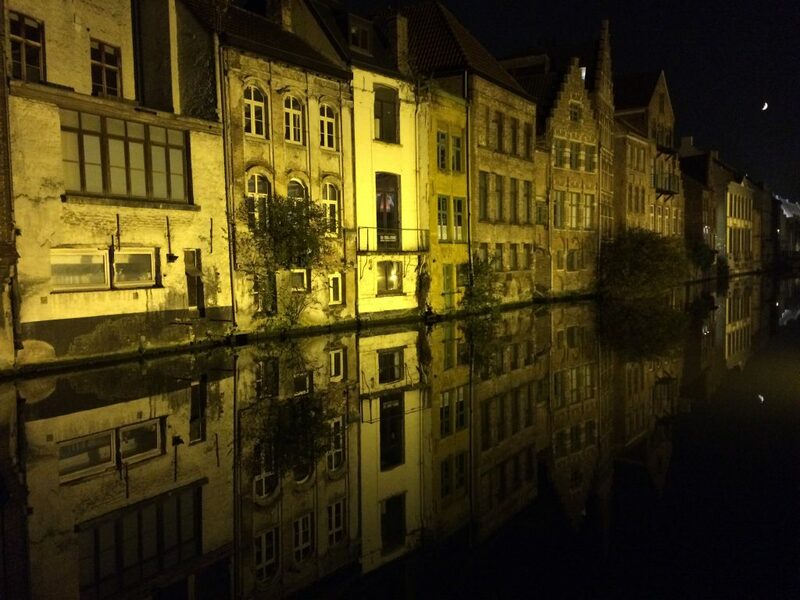 Buildings reflected in the still river. Pier looking badass on Graffitistraat. 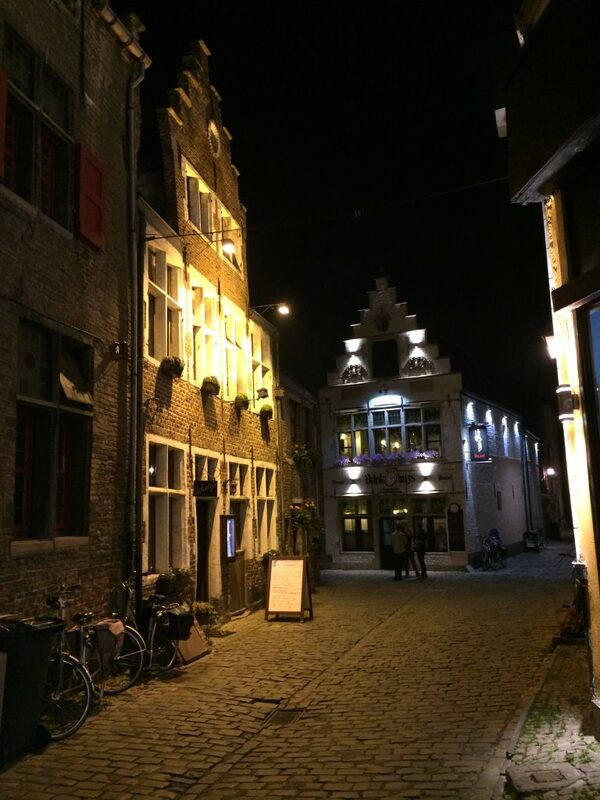 Conclusion: downtown Ghent is gorgeous at night, and very small and walkable. This route goes around the worst of the cobblestones. Notice how parts of the map are shaded pale yellow? This shading denotes “areas of interest” as explained in this article, but for our purposes, the yellow area also coincides with where the terrible cobblestones are. Though this route is a bit longer, it’s much faster because you can cycle at a normal speed. 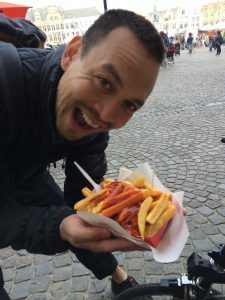 Pier in Markt square with fries and bumpy cobblestones. 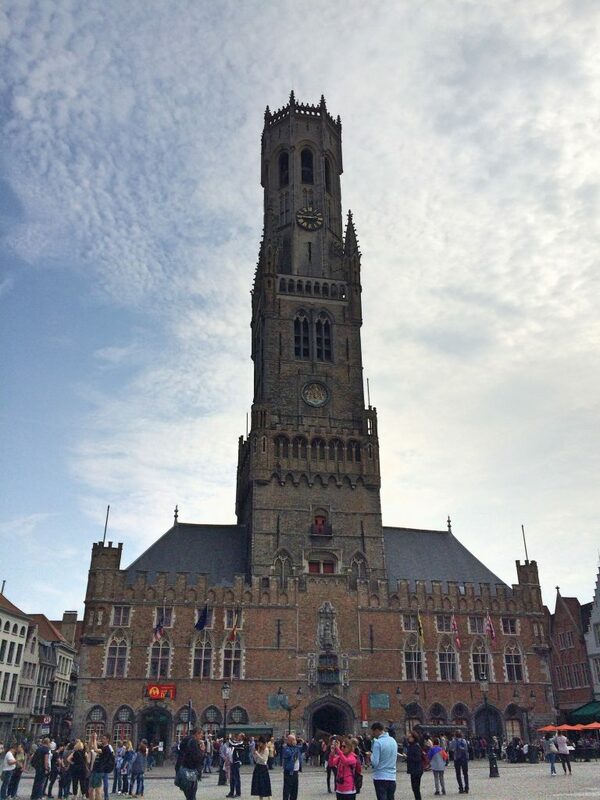 We were here in the fall, so Bruges wasn’t as crammed with tourists as it is in the summer, but there were still lots of tour groups, and biking through hoards of people gawking at everything is basically impossible. 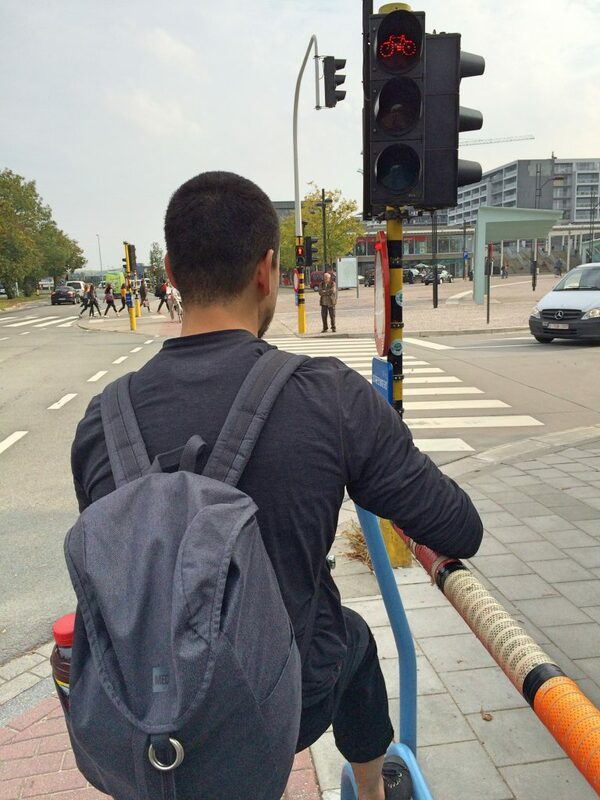 So that’s the first reason why walking is better than biking in Bruges. The second is that the cobblestones are hella bumpy. 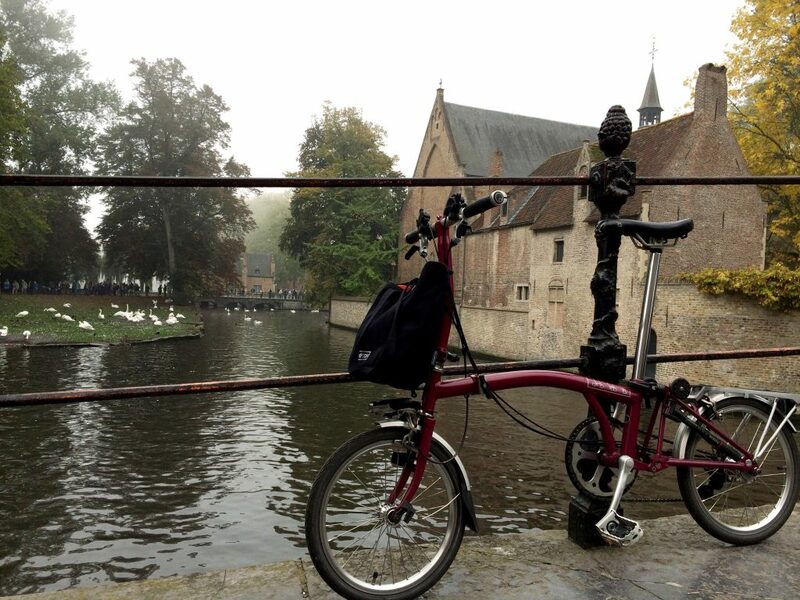 Still, we didn’t regret bringing our Bromptons to Bruges. The train station is a ways from the town centre, so being able to bike instead of take a bus was great. It’s also nice to cycle around the outskirts of Bruges; just be prepared to walk your bike while seeing the main sights in the old town. 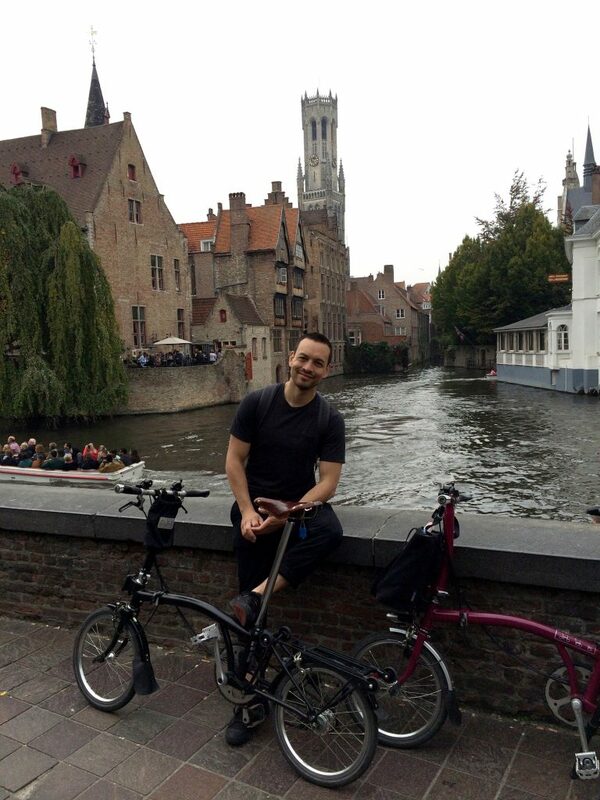 Brompton on a bridge in Bruges. 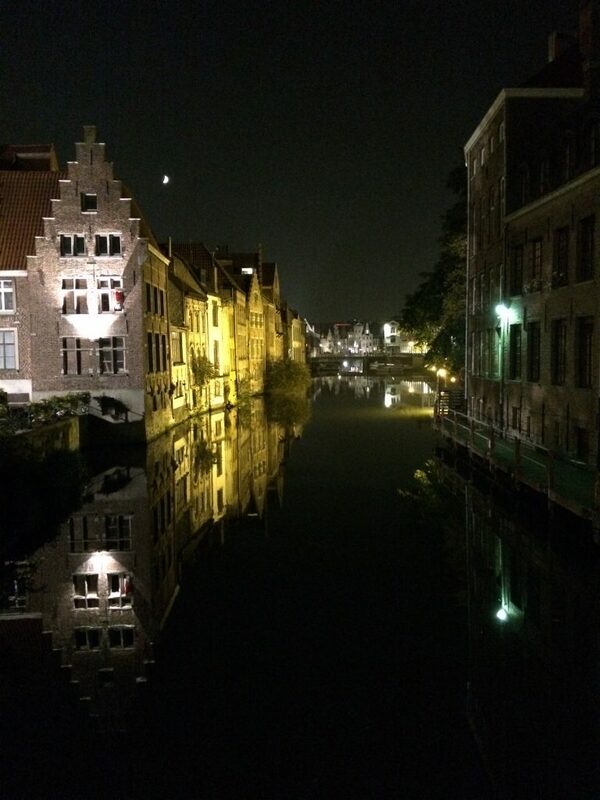 The classic Bruges photo op. Plus, this bridge had the smoothest stones in town! 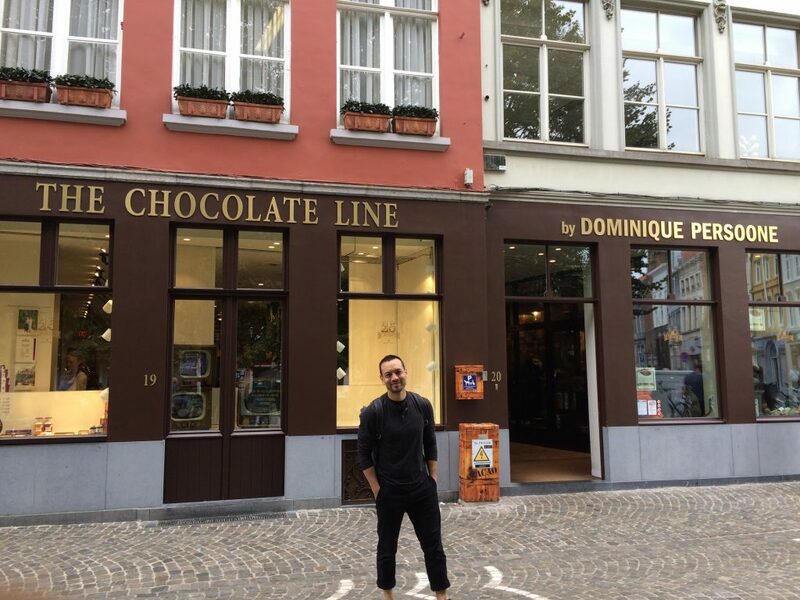 Bruges must see: The Chocolate Line. When briefly going inside chocolate shops and churches, we left the Bromptons locked up outside. 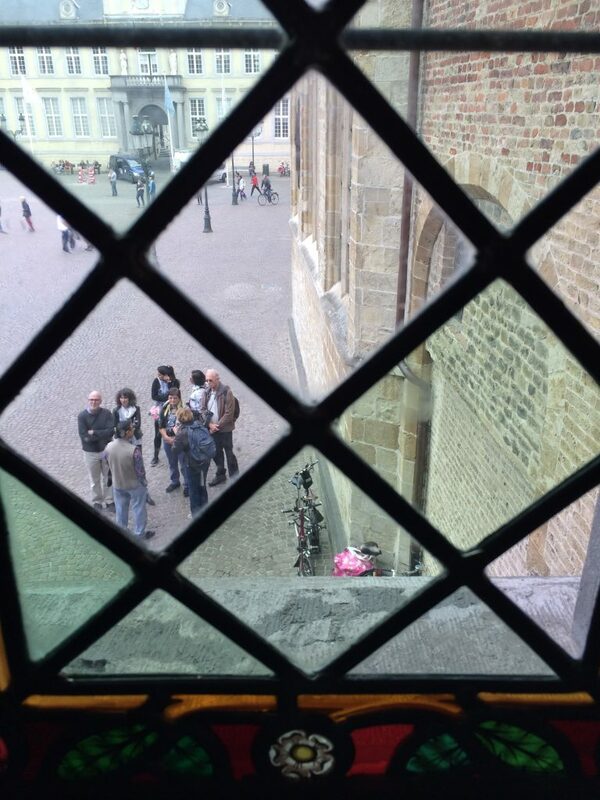 View from the Basilica of the Holy Blood of our Brommies locked in Burg Square. Biking back to the train station, we came across this cyclist foot rest. Handy! Cyclist foot rest + smoother cobblestoned bike path by the Bruges train station. 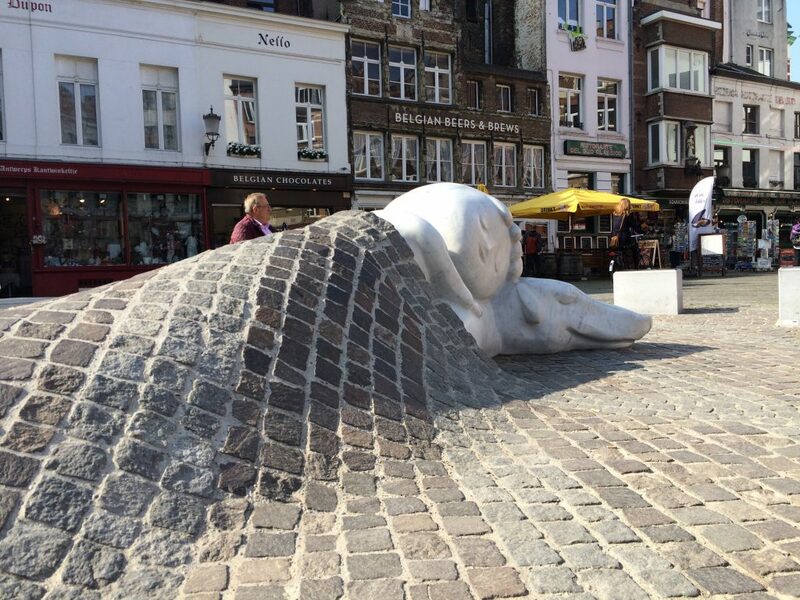 The capital of Belgium wins for WORST COBBLESTONES EVER! The stones in Place Royale were unridable, but we had no choice because it’s also a roundabout for car traffic and if we stopped we had the distinct feeling we’d get run over. Clearly, we weren’t in the Dutch part of the country anymore! 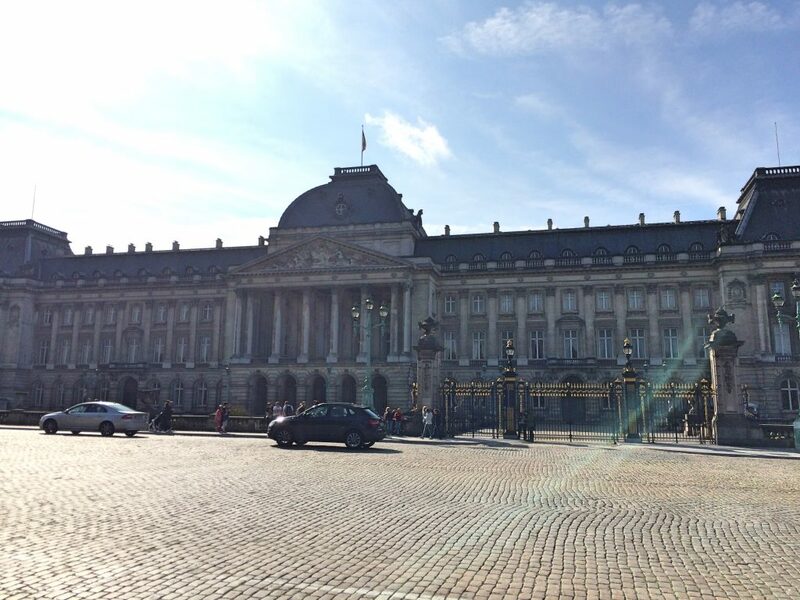 Worst cobblestones ever in front of the Royal Palace, Brussels. Once we got through Place Royale and into Place des Palais, we got off the hellish cobblestones and cycled on the sidewalk, which is still cobblestones but not boneshakingly bad cobblestones. Then we rode through the Parc de Bruxelles and took Rue de Loi east. Here we discovered what little cycling infrastructure Brussels has can be on the sidewalk, marked with red cobblestones. 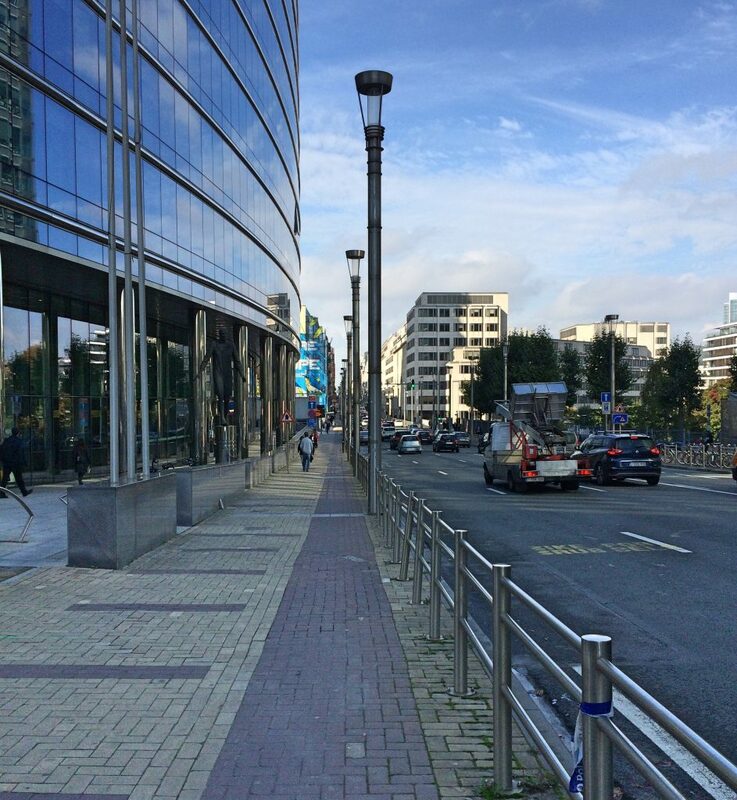 Bike lane on Rue de la Loi. This odd infrastructure did get us safely to Parc du Cinquantenaire and the EU. For these sights, which are far from the city centre, it was great to have bicycles. 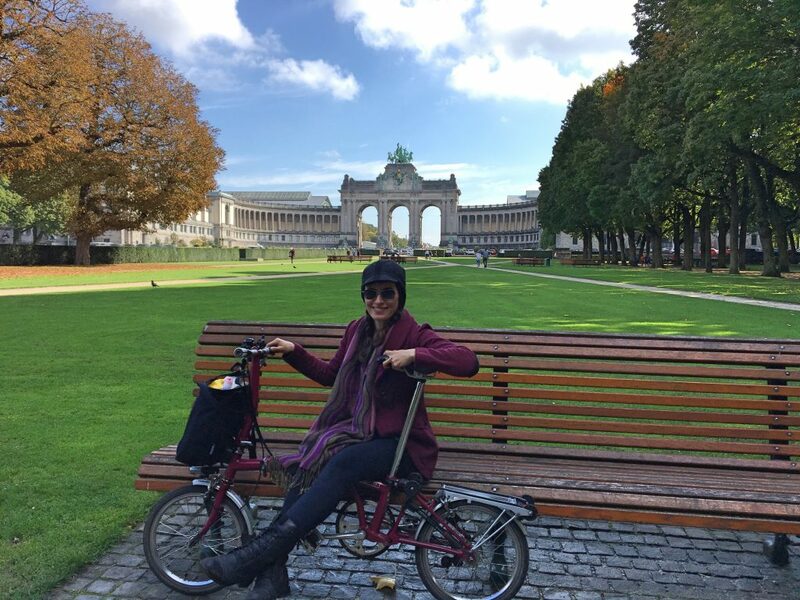 However, in the old town centre of Brussels, we walked our bikes around for the same reasons as in Bruges – horrifically bumpy cobblestones and hoards of tourists. 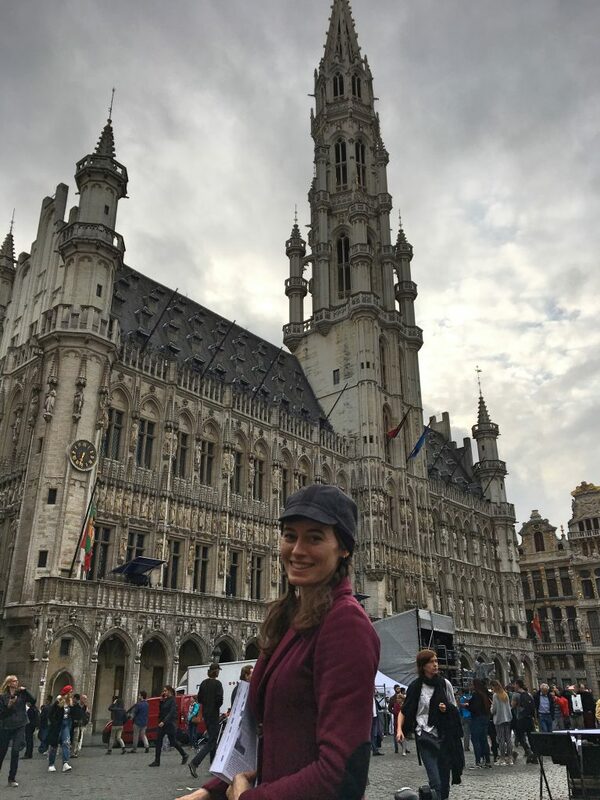 Heather in front of the Town Hall in the Grand Place, Brussels. Car free Rue de Rollebeek is better on foot than bike. 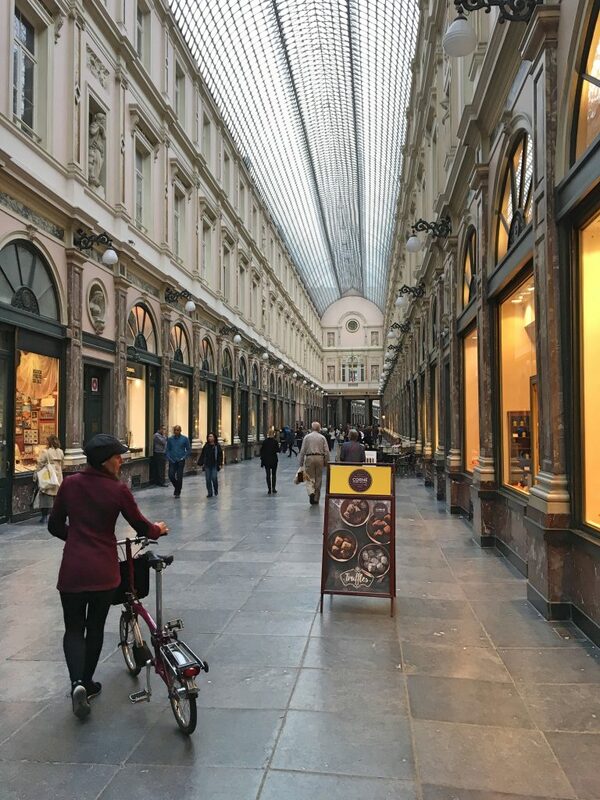 Walking through the Galeries Royales St Hubert. Cycling is more efficient outside the cobblestoned old city, but it’s not for the faint of heart. Infrastructure is sparse and often not separated, relying mainly on painted lines and sharrows. Unlike The Netherlands and the smaller Belgium cities, drivers in Brussels do NOT wait for pedestrians or cyclists—they try to beat them instead. Ah, just like at home in Toronto! 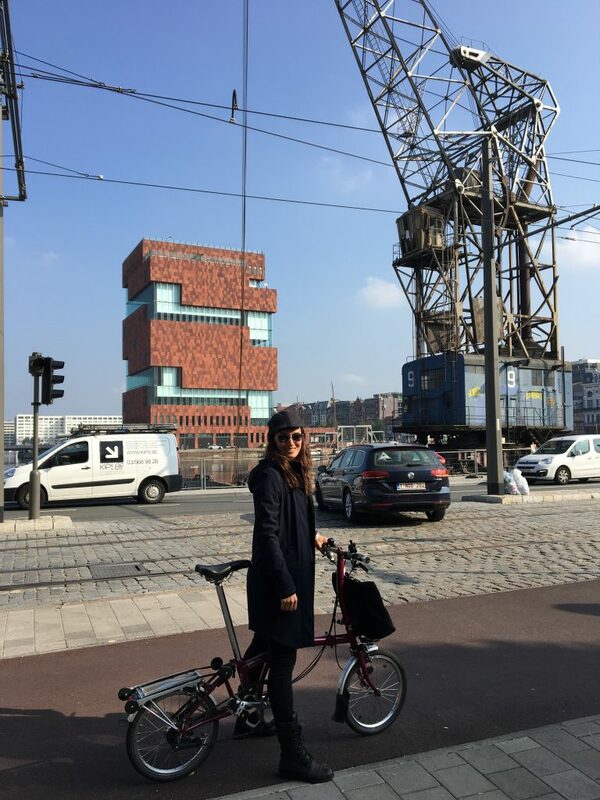 Except for Brussels, cities in Belgium are bike-friendly, but the cobblestones in the old sections where most of the tourist attractions lie are hellish to cycle on. We recommend walking in these areas and using your bicycle to ride to attractions further out of the centres. Check hinge clamps often. Cobblestones can shake them loose. Carry a pump. Riding over constant bumps deflates tires faster. Carry a patch kit. Cobblestones beget flat tires. Otherwise, take it slow and enjoy the sights!